Yoga and body acceptance don’t just have to be good ideas you never get around to implementing. Yoga has helped me to find love for my body and myself. It helped me to overcome my disordered eating behaviors and poor body image challenges. When you have a regular, body-affirming yoga practice, you not only finally have a movement practice you love, you also have the foundation of a well-loved body — and well-lived life. Live Streaming Yoga classes which can be joined live or be practiced in own time. Move, Breathe and Live in a fun, mindful, compassionate and empowering way. A Yoga Class For Every Body, Normal People, Every Day. Because I am here to show you that you can do Yoga too! I have social anxiety, have only a very small budget and don't have a car, so these online classes are just perfect. I find Eugenia's style so patient and friendly its allowed me to try without beating myself up and giving up. I wanted to do Yoga with a qualified instructor. I love the unique mix of yoga and guided meditations which are streamed live. I find the online classes far more beneficial than anything offered free online and am only too happy to pay for this privilege. All Classes are beginners friendly, with size diversity in mind. You can join our weekly LIVE classes like you would do at a studio, or do them in your own time. Classes vary from 20 mins, 30 mins or even 60 mins – depending on your desire and need. The live calls will be announced and might be on different days to make sure everyone gets the chance to be during the live class. However, all videos will be available at all times to watch in your own time or as often as you like. Yin yoga is very restorative and relaxing yoga style focusing on flexibility, mobility and mindfulness. Hatha Yoga incorporates traditional yoga postures adding slow movement and mindful movement. Suitable for beginners and all fitness levels. All Live Yoga classes will finish with a mindfulness meditation to help you to relax, wind down and find stillness. Hi, my name is Eugenia and it would be my honour and pleasure guiding you through the classes. “I have a personal experience of healing body hatred, negative self-talk and an eating disorder with yoga. I believe that yoga can be healing for every BODY, no matter what your story or background is. I believe that every BODY deserves love. Body Love Yoga are the most gentle yoga classes specifically designed for people who don’t feel comfortable going to regular yoga classes because of their body shape or size, because they haven’t done yoga before or just because they are looking for a safe and comfortable environment to connect with other people. 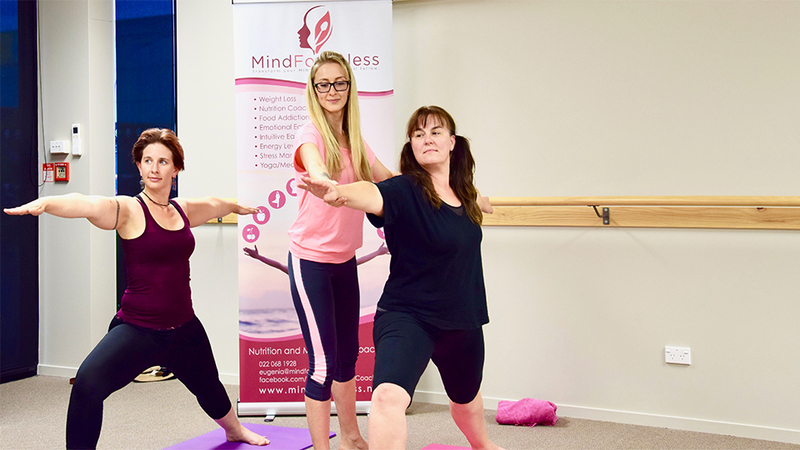 As a qualified yoga teacher it is my mission to provide space for you to experience love and compassion for yourself to reconnect with yourself, your body and who you are. Join Our Online Yoga Community. No Contract. No Commitment. Start your first class right now. I am always here to answer any questions you have. Please CONTACT ME and I will get back to you as soon as I can.